ItemI-02453 - Northwestern Creamery, 1015 Yates Street, Victoria. ItemI-02114 - Douglas Street At Yates Street, Victoria. ItemI-02115 - Quadra Street, looking north from Burdett Avenue, Victoria. ItemI-02116 - Blanshard Street South From Pandora Avenue, Victoria. ItemI-02118 - The Woodward's Store on Douglas Street at Broughton, taken from the corner of Douglas and Courtney Streets; St. Andrew's presbyterian church in the background. ItemI-02119 - Victoria Inner Harbour. ItemI-02120 - Victoria; Imperial Oil Tank Farm. ItemI-02121 - Mccarter Shake And Shingle Mill Rock Bay, Victoria. 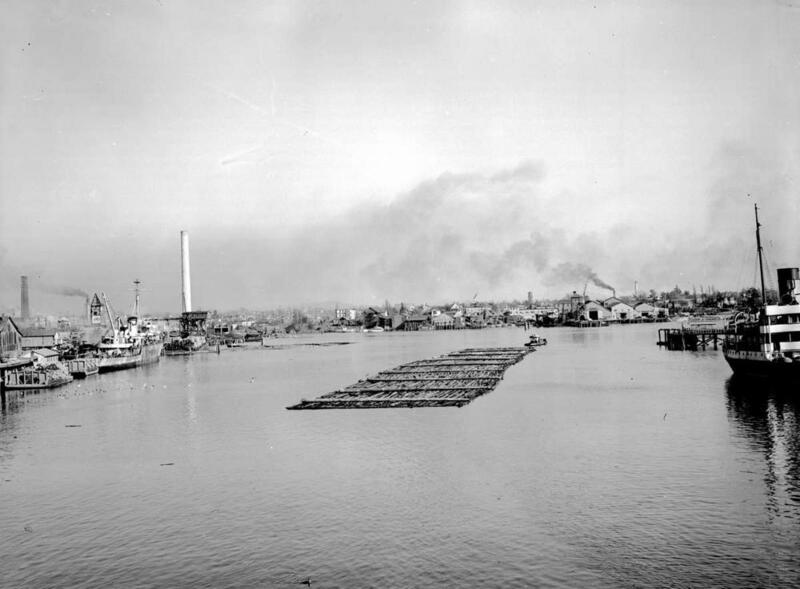 Log boom, various industries with smoke from numerous smokestacks.